Ugandan pop star Robert Kyagulanyi popularly known as Bobi Wine (file photo). 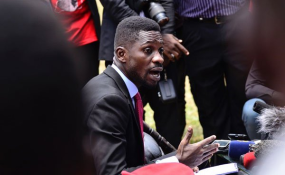 Arua — As the battle for the 2021 general elections draws closer, the man behind the People Power campaign, Kyadondo East MP, Robert Kyagulanyi has said President Museveni's stay in power is numbered. Mr Kyagulanyi popularly known as Bobi Wine made his first return to Arua since the August 13 saga that led to his arrest and torture, for the thanksgiving ceremony of Arua Municipality MP, Mr Kassiano Wadri on Sunday. Last week, the NRM MPs at Kyankwanzi retreat, endorsed Mr Museveni as a sole candidate for the 2021 elections, pitting him to rule further. Mr Kyagulanyi, who announced his intention to run for presidency in 2021 general elections, asked the crowd in Arua to register for national identification cards so that they can be eligible to participate in 2021 elections and protect the votes like they did in last year's Arua Municipality by-election. Gen Muntu said Ugandans should use their mind to fight those in power wielding heavy guns like tankers and rocket propelled grenades to threaten them. The Arua Municipality MP Kassiano Wadri said he would continue to offer good representation to the pressing issues like intermittent electricity that has stifled development and fight corruption in his constituency. During the ceremony, the Bishop of Madi and West Nile diocese who blessed Wadri, said: "Wadri is chosen by God. We need to obey and respect him so that he leads us in this Municipality. Let us use this victory to fight ignorance, poverty, Laziness, drug abuse." Several MPs like Francis Zaake (Mityana Municipality), MP Paul Mwiru (Jinja East Municipality), MP Gerald Karuhanga (Ntungamo Municipality ) attended the meeting where thousands of supporters flocked Arua Hill primary play grounds.